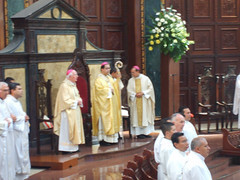 The ceremony was at the Metropolitan Cathedral, presided by Archbishop José Luis Escobar of San Salvador, accompanied by the Archbishop Emeritus of the Archdiocese and the Auxiliary Bishop. About 30 priests concelebrated. The cathedral was full of people and what was most impressive was the large number of young people and children who attended the ceremony, holding banners they had made in honor of the new priests. After the ordination, we visited the tomb of Archbishop Romero, the Archbishop of San Salvador who was assassinated in 1980, in the crypt of the Cathedral. 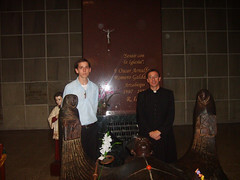 Then we went to the parish of Fr. Manuel de Jesus in Quezaltepeque, where he was received with jubilation and traditional songs. After lunch, we visited the parish and greeted the pastor. The next day, we visited the hospital chapel where Romero was killed while celebrating Mass and the humble, simple room where he had lived. 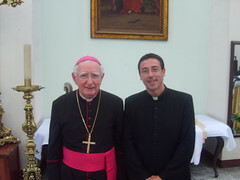 In the afternoon, Father Manuel celebrated his First Mass at a chapel in his parish of twenty-four years, where he had grown in his Christian faith, receiving catechesis and later teaching it to others, as well. We were able to savor the delicious Salvadoran "pupusas" and experience the love of the people for their priests. The people of El Salvador are a profoundly religious and hospitable people. Finally, we went to the Parish of San Ramon, where Fr. 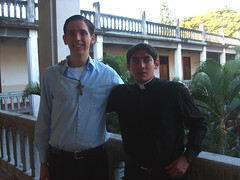 Manuel had carried out his pastoral ministry as a deacon and where he will continue to minister as a priest now. There, also, we were greeted with great love and offered typical Salvadoran dishes and gifts. We thank Fr. Manuel and his family for the warm welcome that we all enjoyed, for hosting us in their homes, and for treating us with such great affection that we truly felt at home.